This shows the honeycomb-like structure of lithium osmium oxide. Image: Oregon State University. A new material created by researchers at Oregon State University (OSU) represents a key step toward the next generation of supercomputers. These ‘quantum computers’ will be able to solve problems well beyond the reach of existing computers while working much faster and consuming much less energy. The concept of quantum computing is based on the ability of subatomic particles to exist in more than one state at any time. Classical computing relies on bits – pieces of information that exist in one of two states, a 0 or a 1. In quantum computing, information is translated to quantum bits, or qubits, that can store much more information than a 0 or 1 because they can be in any ‘superposition’ of those values. The difference between bits and qubits can be understood by visualizing a sphere. A bit can only be at either of the two poles of the sphere, whereas a qubit can be anywhere on the sphere. What that means is much more information storage potential and much less energy consumption. Researchers in OSU's College of Science have now developed an inorganic compound that adopts a crystal structure capable of sustaining a new state of matter known as a quantum spin liquid, an important advance toward quantum computing. In the new material, known as lithium osmium oxide, osmium atoms form a honeycomb-like lattice, enforcing a phenomenon called ‘magnetic frustration’ that could lead to a quantum spin liquid, as predicted by condensed matter physics theorists. The researchers report the new material in a paper in Scientific Reports. Corresponding author Mas Subramanian, a professor of materials science at OSU, explains that in a permanent magnet like a compass needle, the electrons spin in an aligned manner – that is, they all rotate in the same direction. "But in a frustrated magnet, the atomic arrangement is such that the electron spins cannot achieve an ordered alignment and instead are in a constantly fluctuating state, analogous to how ions would appear in a liquid," Subramanian said. The lithium osmium oxide discovered at OSU shows no evidence for magnetic order even when frozen to nearly absolute zero, which suggests an underlying quantum spin liquid state is possible for the compound, he said. "We are excited about this new development as it widens the search area for new quantum spin liquid materials that could revolutionize the way we process and store data," Subramanian said. "The quantum spin liquid phenomenon has so far been detected in very few inorganic materials, some containing iridium. Osmium is right next to iridium in the periodic table and has all the right characteristics to form compounds that can sustain the quantum spin liquid state." 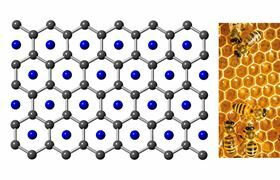 Arthur Ramirez, a condensed matter physicist at the University of California, Santa Cruz, and one of the co-authors on the paper, noted that this compound is the first honeycomb-structured material to contain osmium and expects more to follow. Ramirez also noted that this study demonstrates the importance of multidisciplinary collaboration involving materials chemists and condensed matter physicists engaged in synthesis, theory and measurements to tackle emerging science such as quantum spin liquids. The next step for Subramanian's team is exploring the chemistry needed to create various perfectly ordered crystal structures with osmium. This story is adapted from material from Oregon State University, with editorial changes made by Materials Today. The views expressed in this article do not necessarily represent those of Elsevier. Link to original source. By studying electron spins in an ytterbium crystal, scientists have detected strong signs of a quantum spin liquid appearing at near absolute zero.